A personal SWOT Analysis is needed to understand where one stands with respect to ones career and life path. A personal SWOT Analysis is usually the first step towards recognizing ones position in attempting to deal with lifes challenges and career prospects. First, one should never overestimate or underestimate ones strengths. Therefore, a personal SWOT Analysis must be objective and to the point as far as delineating, ones strengths are concerned. The reason we mentioned not to underestimate or overestimate ones strengths is that while many tend to overestimate their strengths, there are some who underestimate them as well. Therefore, the identification of ones strengths must be done by listing all the attributes one thinks are the key assets and then penning them down to understand where ones key personality traits would lead them. For instance, many people have superior communication skills, people management skills, and an ability to crack aptitude tests as strengths. On the other hand, there are many for whom these very skills are lacking and hence, listing the components of the SWOT would help them in gaining a true picture of where one stands. Listing the strengths along with the weaknesses gives one an opportunity to identify areas of improvement as well as to note those areas where one need not spend much time on. We have to remember that time is precious for many of us and hence, understanding where one stands would help us to ration it better to concentrate on the weaknesses. For instance, if problem solving is your weakness, then you must spend more time honing your skills in that regard. Apart from that, if communication skills are your weakness, you must enroll in spoken English or a communication course that would help you polish your skills. Once the strengths and weaknesses are listed, you must identify the opportunities that can come your way and build yourself accordingly to tap into those opportunities. You must remember that you need to build a door for opportunity to knock on it as well as remember the fact that success in life depends to a large extent on how well one anticipates the future by observing the trends of the present and then preparing accordingly for the same. As the saying goes, chance favors the prepared mind and hence, accurate identification of opportunities is one critical aspect that would make or mar your chances in career and in life. 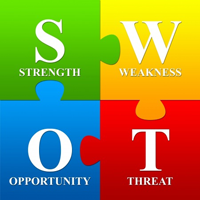 The last element of the personal SWOT Analysis is the assessment of threats. One should not go into battle without scanning the environment for potential threats. Hence, one must be cautious about the direction one wants to take and list down the threats that would contribute to failure. For instance, if you foresee that in the near future, your finances are likely to be tight, you must plan accordingly so that you do not go deep into debt. Often, the biggest threat to many individuals is managing the cash flow situation as well as understanding the blind spots that prevent people from assessing a situation for what it is. The blind spots we are referring to are the mental blocks all of us when assessing our personal SWOT elements and these prevent us from an honest assessment of where we stand and what our weaknesses are. One can list down any number of strengths and any number of opportunities. However, the tough part is to accurately and reliably identify the threats and weaknesses as otherwise we would be blind to them because of self-love. The key aspect here is that one must not be caught up in ones own shadow thinking that one is invincible. Hence, proper identification of weaknesses and threats goes a long way in ensuring that one is not caught by surprise.